Very nice apartment (32 m²), located approximately 100 meters in a straight line from the sea in which can be accommodated up to 4 people, category ***, third floor, air conditioning, TV, satellite TV, internet, one room with exit to the balcony, kitchen, bathroom, washing machine, iron, ironing board, private parking, grill, balcony (6 m²), view of the sea, table and chairs on the balcony, smoking is not permitted in the apartment. Kitchen equipment: kitchen utensils and tableware according to the number of persons, electric kitchen, electric kettle, fridge (130 L), deep freeze (10 L), air absorber (cooker hood). Small pets are welcome, the service an additional fee of € 5 per night. Washing machine, iron, ironing board, service on request (included in the price). Number of rooms: 1, the total number of beds in room: 3, number of double beds: 1, number of single beds: 2 (including one folding bed). 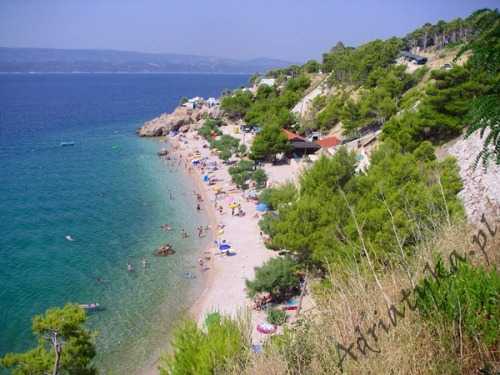 Distance to the bus stop is 150 m, distance to the train station is 40 km (Split), distance to the nearest airport is 70 km Split (Trogir), distance to the nearest ferry port is 20 km (Makarska), distance to the main road is 90 m, distance to the nearest exchange bureau is 150 m (post office), distance to the cash point is 7 km (Omis), distance to the restaurant is 80 m, distance to the grocery store is 150 m, distance to the petrol station is 7 km. 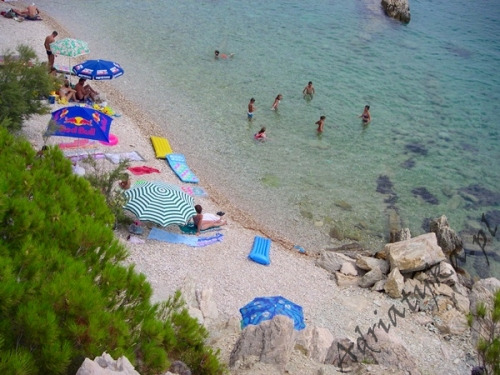 Very nice pebble / rocky beach, distance to the beach is 150 m, distance to the sea is 150 m. The sandy beach is located approximately 7 km from the building (Omiš). The apartment is on the third floor of a nice, large building. Guests have at their disposal internet, private parking, balcony with sea view, table and chairs on the balcony and grill. Air conditioning: paid service €5 per day (only when it is used).